Developed over 8 years with low intensity inputs – ie twice yearly permablitzes plus occasional maintenance. 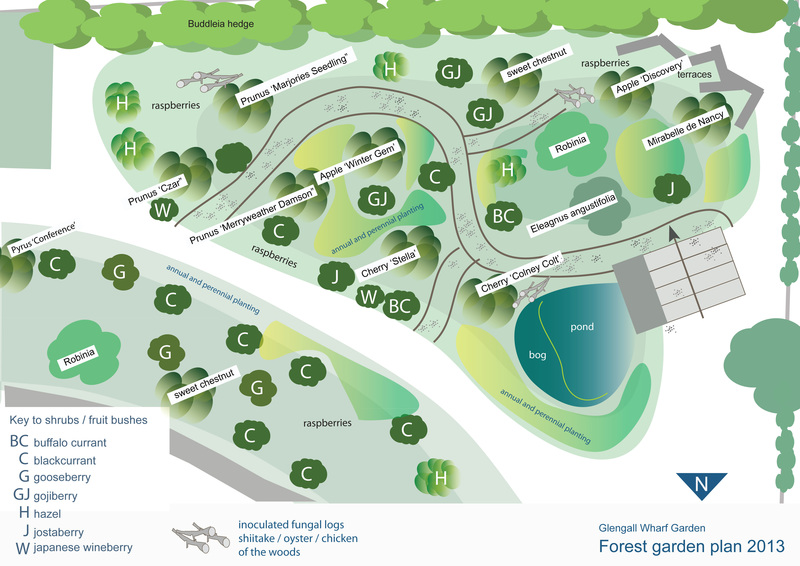 A low maintenance, sustainable and biodiverse agroforestry system based on a woodland eco system. The woodland layers are built up using edible and useful plants, carefully placed to ensure they have space and light to flourish. 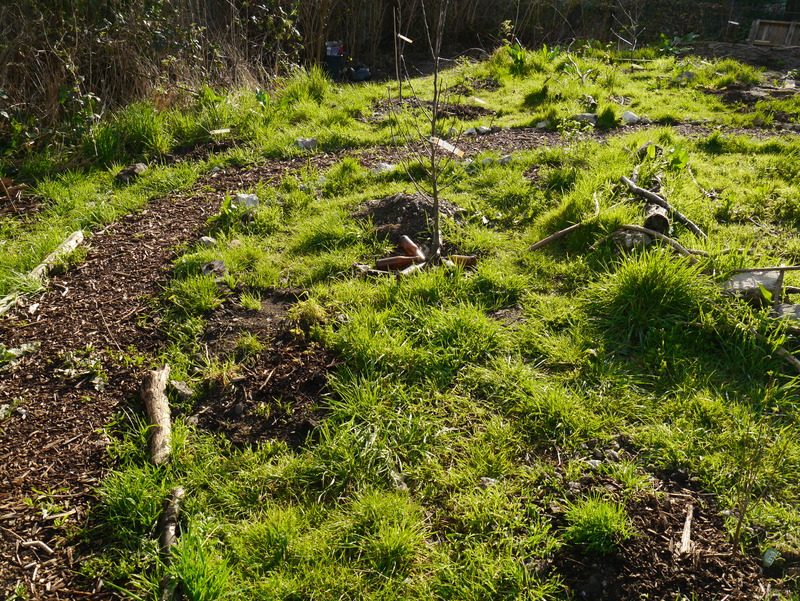 Glengall Wharf’s forest garden is being developed on a low heap of rubble with a thin soil covering. Clearance of perennial weeds eg bramble. 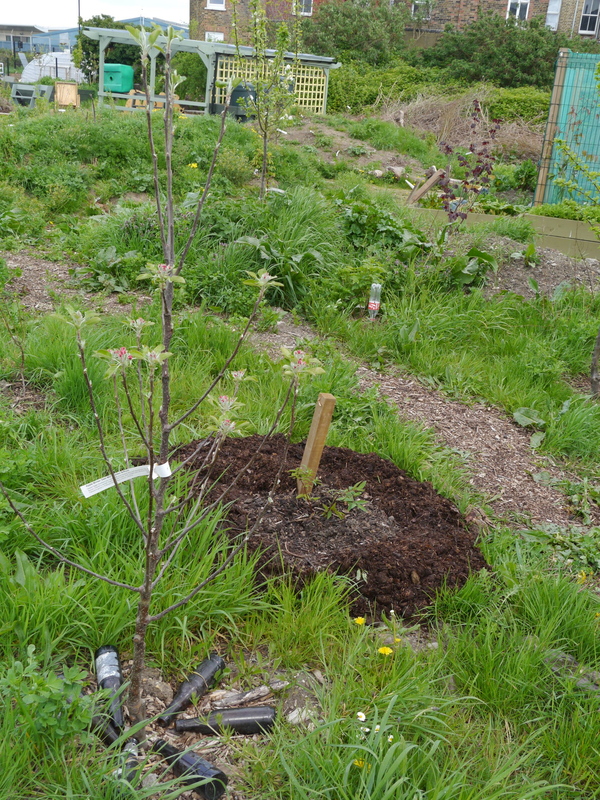 Created tree pits filled with good soil, well rotted manure and biochar*. Planting of canopy layer ie trees inc apple varieties, pear, hazel, chestnut, plum, damson, cherry and also less common species e.g. Eleagnus angustifolia (a useful nitrogen fixer). Planting of shrub layer inc black currant, jostaberry, gooseberry, goji, blue honeysuckle /honeyberry, buffalo currant and japanese wine berry. 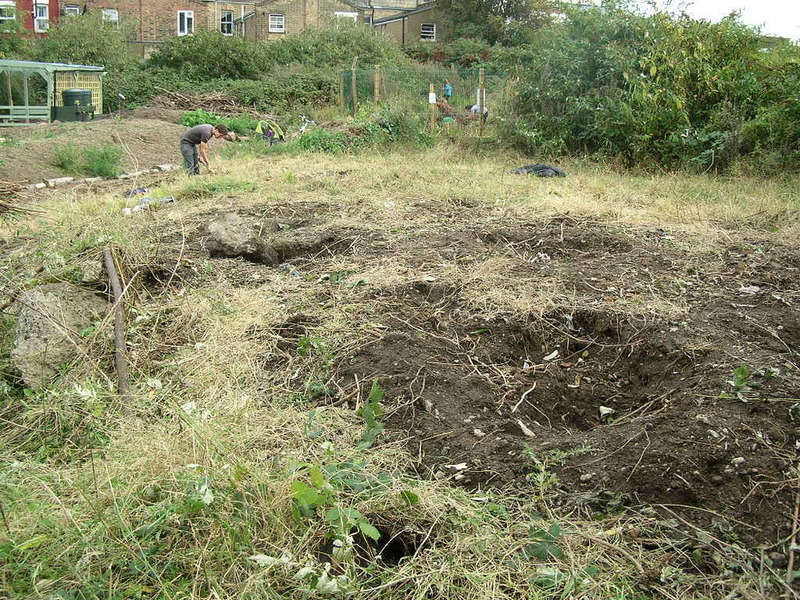 Additions of a thick sheet / lasagne mulch to manage existing weeds and create new soil for further planting. We have added an 8th layer, a fungal layer through the use of woodchip as a mulch (will be rotted down by fungi existing in the wood) and the addition of inoculated logs of shiitake, oyster and chicken of the woods edible fungi. * Biochar – is essentially charcoal, but burnt at a lower temperature and with a more restricted flow of oxygen. It works in several ways. Though it is not filled with nutrients itself, it is able to attract and hold on to nutrients, so preventing them from leaching away, and holding them just where plants can reach them. Its porous nature provides refuges for mycorrhizal fungi, which in effect enlarge the plant’s root system while also increasing its resistance to diseases. It makes soil far more attractive and stable for beneficial microbial activity. Essentially it does everything organic matter does to the soil, but better, and permanently. First spring – fruit/nut trees and shrubs planted and mulched.